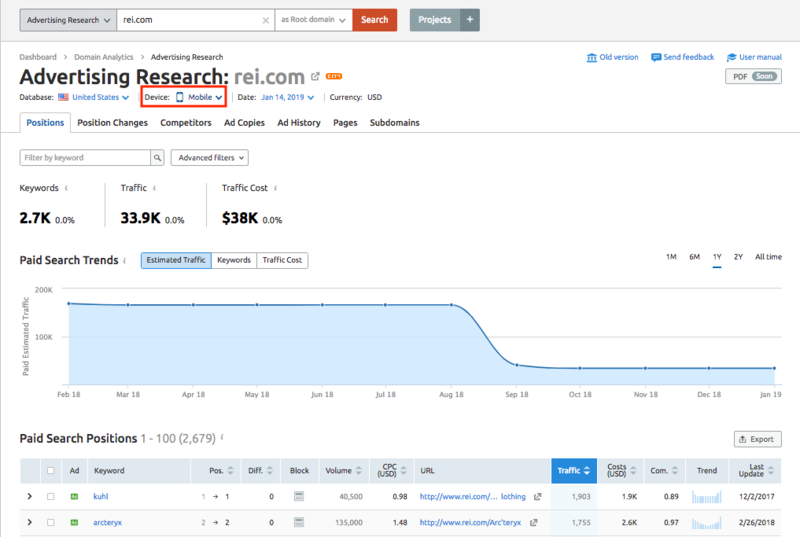 In the Advertising Positions report, you’ll be able to see the keywords and landing page URLs that SEMrush found a domain ranking for with paid ads on Google Ads. The volume and traffic numbers in this report represent an estimated average monthly value. Enter your competitor’s web address in the search bar and begin gathering insights! Keywords: the total number of keywords where the domain was found with a PPC ad ranking in the top 7 Google Ads positions. Traffic: the estimated traffic coming from these paid keywords (based on keyword search volume and CTR averages per position). Traffic Cost: the estimated price of paying for the PPC ads to rank in the positions we found them ranking in the past month. These numbers can give a quick snapshot of how much a domain is participating on Google Ads to promote their website. These are also the 3 options for the Y axis of the line graph. The graph at the top of this report can be adjusted to measure the domain’s estimated paid search traffic, keywords, and estimated traffic cost over time. It is also reactive to any advanced filters that are applied, so you can pinpoint data as specific as you need. The date range of the graph can be adjusted between one month, six months, one year, two years, and all time. Below the graph will be the table containing all of the keywords the queried domain is bidding on to run their ads. You can see the position, search volume, cost per click, URL, and more for each keyword. To view the ads and landing pages of these keywords you can hover over the green “Ad” icon in the far left column to see how the ad appeared. With the arrow at the far left of each row, you can expand the keyword and see the months where SEMrush saw the specific ad from this advertiser. The landing page URL will also be there and you can click on the blue link to open a URL. Click on the small arrow icon beside any of the URLs to see the actual landing page associated with each keyword, and click on the small arrow icon beside any of the URLs to go to the actual landing page associated with this ad. Above you can see both the same Keyword and the same Landing page in multiple rows, but that’s due to different Ads ranking for the same keyword, and pointing to the same landing page. The filtering options of this report allow for users to narrow down the list into precise, targeted sets of keywords. You can filter the list by keyword with the search bar above the table, or click on the filters button to open up the filters menu. Using filters can be an excellent way to find a narrow, specific list of low-cost or low-competition keywords that will be valuable to add to your PPC campaign. Currently, there is no limit to the number of simultaneous filters users can add to a report, and there are over ten different metrics to filter by (keyword, keyword type, position, volume, CPC, URL, traffic %, costs %, competition level, number of results, date of the last update). This allows users to gather data as specific as they need. After adding filters, you can export this data as a CSV file, excel file, or PDF. If you are viewing data in a database that also has mobile data, you can choose to view a mobile report in addition to the desktop report. Just switch your device (at the top of the report) from Desktop to Mobile. In the mobile report, you’ll see all of the mobile keywords that trigger ads for this domain. The top of the report will show the total number of mobile keywords the domain is bidding on and receiving traffic from. At the top to the right is the Positions Distribution Trend, which will display how many of these mobile ads are in positions 1-3 and positions 4-7. Please note: If you query your own website in this report, you’ll probably notice that these numbers do not match your internal analytics exactly - that’s because they’re only estimations based on what SEMrush can see on Google’s public SERPs. SEMrush cannot access anyone’s internal Google Ads or Google Analytics data. We can make our estimations based on the keywords we have in our database, which contains millions of keywords and the top 7 positions for Google Ads. The data presented in Domain Analytics is national level data, not based on local search volumes or positioning based on specific location. Therefore, any ads that your domain may be ranking poorly or any low-volume keywords that you bid on will not be in our system. However, if you are trying to take a look at a competitor without having access to their internal analytics these estimates are highly accurate and based on real data that updates within every month (just look for the “Last update” column.